Many of you probobly feel like my husband about squash. Can't eat it, won't eat it, don't like the flavor, the texture, or anything about it. But this one will change your mind. It has an eatible skin, but it stores just like acorn squash. (Ie: forever... lol) it is mild, but can be used in anything and it is good just with salt cooked in it's own skin. What kind is it? 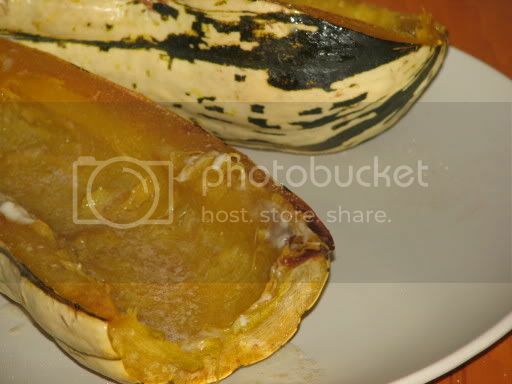 The Delicata winter squash. It was popular in the early 20th century but was susceptibile to disease and there for went out of style for a while. It is now back with a new hybrid that helps the disease factor and the two years my farm friends have grown it they have had no trouble with disease or needs for fungicides. These somewhat normal looking squash pack the biggest flavor punch you could imagine... but are mild enough to be used in soups (savory or sweet) and are wonderful enough to just be eaten alone whole and unaltered baked in a 350* oven for 30 minutes. hmmm...looks like it would work for pumpkin pie. Have you tried it for that? Nope... we have pumpkins for that. :) These farm friends also grow a really wonderful variety of cooking pumpking that we get starting the first of Oct each year. Last year they did a feild trip with Cyan's school and all of the kids got one, so then I went in and made pumpkin chocolate chip spelt muffins with ours and took them back to the school. It was a very eye opening experience for the kids who were more mainstream. Some had no idea you could make food out of squash.